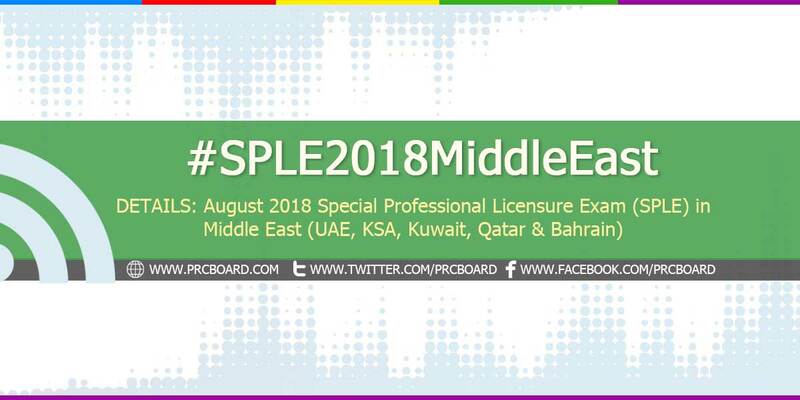 MANILA, Philippines - The Professional Regulation Commission (PRC) announced the details and application schedule of the Special Professional Licensure Examination (SPLE) formerly known as SPLBE for countries in the Middle East for the year 2018. As posted, the August 2018 SPLE will be conducted on August 24-26, 2018 in testing locations at the following countries. PRC announced that the commission will administer licensure examinations of the following programs on the abovementioned date and locations. PRC said that interested applicants shall apply online via SPLE Online Licensure Exam and Registration System. Upon completion of online application, the applicant shall submit the photocopies of basic and specific requirements together with printed and signed application form at Philippine Overseas Labor Offices (POLO) on or before May 25, 2018 (deadline). POLO will then submit the pre-qualified applicants to PRC on or before June 8, 2018. The list of conditionally approved applicants will be posted at PRC official website which shall then be forwarded to the seven (7) testing locations. Printed and signed online application form. Original copies of the documents mentioned above shall be presented by the examinee and will be validated by PRC SPLE team on respective venue of assignment. Aside from the basic requirements posted above, these specific documents required by each regulatory boards shall be secured by the applicant, courtesy of the Professional Regulation Commission. PRCboard.com is among the trusted websites when it comes to providing timely and reliable information on any government-related examinations. Further updates about August 2018 SPLE board exam results and related news and announcements can be retrieved at this website or at our social media pages via Facebook and Twitter. Hi. Possible din po ba magkaroon ng PRC licensure exam for medtech sa mga hindi pa po nagtake ng exam before sa PH? Thank you. any update on this quiry? 2019 registration? Hi any update for 2019 licensure schedule? Any update for SPLE 2019?